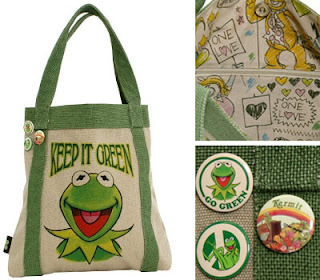 Even the lining is special, with Muppet sketches plus cute Kermit pins on the bag's outside. Adorable! It's never been more cool to be green! Don't be ashamed, Kimmy! You are not alone! I have the Kermit from when I was a kid and he's going nowhere. Love him. Love the muppets. You should check out my post from last November when I visited FAO Schwarz in NYC and made our own Muppet what-not.